In 2013, Dandan from Beijing Union University’s School of Special Education was invited to the United States to attend the 2013 Microsoft Company Meeting. Facing more than 20,000 conference attendees, Dandan, hearing impaired since childhood, expressed in standard Chinese sign language: “Speaking has always been my dream. I would like to thank technology for making my dream come true.” Her sign language was picked up by Kinect, recognized by the computer, and then translated into English in real time. As this sentence came into display on the big screen, many Microsoft employees were moved to tears. This project was named Kinect for Sign Language Translation, a joint effort of Professor Xilin Chen from the Institute of Computing Technology, Chinese Academy of Sciences; Professor Hanjing Li from Beijing Union University; and Dr. Ming Zhou and Dr. Xin Tong from Microsoft Research Asia. Dandan and her classmates assisted the researchers in building a sign language database. When Microsoft Research Asia enabled computers to surpass humans in visual ability during the 2015 ImageNet challenge, a Microsoft engineer who lost his sight when he was seven years old designed a pair of glasses based on computer vision algorithms. Whenever he wanted to see something, he would slide his finger against his temples to snap a photo, and then the computer would then analyze the photo. The project, called Seeing AI, also provides a mobile app that helps the visually impaired read text and documents, and identify objects, people, and currencies. The technology behind the two projects described is artificial intelligence (AI). Nowadays, AI is changing our lives and is revolutionizing every industry. While it creates many opportunities for human society, AI also brings many challenges. What does a future with AI look like? With what kind of attitude should we welcome this technological era? The best way to anticipate the future is to participate in its creation; and to participate, one must have a clear and comprehensive understanding of AI. In this article, we not only want to discuss what AI can do, but also look at what AI should do and try to explore the best path to take so that AI benefits humanity. How do we describe the challenges that AI brings? Transformative technology is always followed by questioning voices. While we thank AI for all the positive changes it has brought into our lives, there are still concerns about this technology. When computer professionals come together, they often discuss the advantages of AI, but we cannot turn a deaf ear to public concern. What challenges does AI bring to human society? We have summarized it into the following three points. The first challenge: Machines may replace humans, causing unemployment and further wealth inequality. In 2017, a study conducted by McKinsey analyzed the work content of 820 jobs in the United States and found that 49 percent of the content could be replaced by today’s technologies. Many other studies have had similar conclusions. Of course, it would take time for these jobs to be replaced, and technology development can also create new job opportunities. Whatever the case, future changes in the workplace are inevitable. In the previous era, one of the reasons the rich were richer and the poor were poorer was because the return on capital is higher than the return on labor. In the current age, people with data and technology have even greater power than those with capital. The era of AI has therefore brought about a new concern: when data and technology are harnessed by a few people, especially those who possess capital, their power becomes immeasurable. At the same time, as AI applications rapidly increase in popularity and production technologies continue to mature, the cost of replacing human labor with machines is also lowered. Unemployment and unequal wealth distribution issues will become more severe. This is the first challenge we face. The second challenge: AI threatens human security and social order. Stephen Hawking was worried about a future where AI is smarter than humans and repeatedly warned humans about AI. Elon Musk also said that humans needed to be very cautious about AI, which, according to him, could be more dangerous than nuclear bombs. This represents the attitude of some in the scientific community. They worry that if AI becomes powerful enough and remains uncontrolled, the result would be devastating. These issues involve not only technology, but also policy, regulations, and ethics. The broader the scope of AI application and the stronger its execution abilities are, the greater responsibility those using the technology shoulder. This is a test that AI must face in the future. At the same time, we are also concerned about how humans will behave in the era of AI. This second challenge is a question of the current era, posed by science and technology. The third challenge: AI may cause information monopoly or polarization of opinions. We are used to opening up a search engine to look for the information we want and perusing the results selected. The Internet has reduced the distance and cost of communication, with big data and AI allowing information dissemination to be more precise; but these also increase the risk of information being monopolized and controlled. In the era of AI, data and information may be controlled by a few dominant players, who could control the flow of information to build information barriers. At the same time, the recommendation algorithm under AI technology may lead to the generation of prejudice. For example, if we frequently read certain types of news, the system would continue to recommend similar types of news. When a large number of search engines and Internet products start using the recommendation algorithm, we would lose the possibility of gaining exposure to more information. When the frequency of dissent decreases, existing opinions are repeatedly strengthened through the recommended content and people with similar positions would gradually gather together through algorithms. This would lead to greater polarization in society. We recognize data as the key to competitiveness in the era of big data, and so we set the collection and selection of data as the initial step in designing AI. However, information monopoly is not the result we want to see. It is also not fair to select certain representative data. Deciding on the method to obtain data and to not have it be monopolized by a few, and to use data but not let it strengthen polarization, is another challenge we face. As we look at the challenges posed by AI, the problem has changed from the initial “what it can do” to “what it should do.” AI is creating many opportunities, but it also brings uncertainty. We should maintain an open attitude and continue to ask questions, calmly confronting the challenges and seizing the opportunities. How can we reduce the impact of automation? How should wealth be distributed so that all individuals have equal access to having their basic needs met and protected? After autopilot cars get out onto the roads, how would we set up traffic regulations? In what direction should computer science develop in order to minimize or even eliminate errors in AI programs? To address the AI challenge, there are four paths to consider. The first path: Promote universal education in computational thinking and allow everyone to understand and become a beneficiary of AI. Behind the fear that computer intelligence would transcend human intelligence is a lack of computational thinking training in basic education. Allowing a new generation to learn to use the basic concepts of computer science to solve problems, design systems, and understand human behavior is becoming the key to building their future competitiveness. Computational thinking, like language and mathematics, is not just an ability that professionals in the computer science field require. Many people categorize language and math as tools, believing that the significance of learning them lies in the fact that they would come into use in the future. This actually deducts from their value. Language is a way of thinking. Without language, people would not be able to think, or at least they would not be able to do so with precision and logic. Communication, therefore, is not the sole purpose for language learning. The same is true of mathematics. When we see a messy pile of things, we would go count and classify them. This type of reasoning and action has become part of our thinking. Computational thinking is the same. What is programming? Programming is a type of description. Humans tell machines what to do, and the machine then executes and produces the result. Making a machine “obedient” requires logic, structure, modualization, and attention to details. These abilities can all be used towards solving real life problems. We need to allow more people to possess the ability to understand AI. Just like language and math, which we start learning when we are young, computational thinking also needs to be popularized. One of Microsoft’s goals is to promote the universalization of AI. Since 2014, Microsoft Research Asia has actively cooperated with the Ministry of Education of China and various educational institutions, from primary schools to universities, using computational thinking as an entry point and reforming the model for basic education in computer science through cooperative projects between industry and academia. In the past five years, nearly 140 related courses were set up in more than 110 college and universities in 29 provinces and cities nationwide, with key universities in the developed eastern regions driving the growth of local universities with scarce teaching resources in the west, benefiting millions of teachers and students. At the same time, competitions such as Imagine Cup, The Beauty of Programming, and Hour of Code have allowed the concept of computational thinking to be valued by the higher education and basic education fields, contributing to the promotion of this concept. The new era of information and technology makes new demands for talent, and the importance of basic education in computer science and computational thinking is increasing. Microsoft is working with scholars in the computer field to create more possibilities for this new era. The second path: Promote the digital transformation of various industries. Since the application of AI is inevitable, we must take pains to ensure that all industries and organizations have access to its benefits. We have seen the widespread application of AI in fields such as education, medical care, nursing care, environmental protection, urban operations, and judicial services. The core of AI development is data, and all industries store large amounts of data. If AI makes effective use of these data, reform and innovation in the various industries would no longer only be a vision. The significance of digital transformation goes far beyond the digitalization of traditional businesses, which is only the first step in the journey. Creating intelligent systems and processes is the destination we hope to reach. AI technology should be integrated into all fields and industries. It should be combined with specific application scenarios to transform traditional work patterns and product forms completely. For example, Microsoft Research Asia cooperated with China Asset Management on the research of AI application to the financial services field, jointly developed the English learning application Longman Xiaoying with Pearson Education, and partnered with Orient Overseas Container Line to improve the efficiency of shipping network operations by applying AI research. In the medical field, Microsoft Research Asia and Pfizer have collaborated to build knowledge maps and intelligent Q&A systems for common chronic diseases such as coronary heart diseases, strokes, high blood pressure, and high cholesterol, to improve communication between doctors and patients. If the emergence of the Internet was the big opportunity of the last century, then digital transformation is the opportunity presented for the current century. With the development and breakthrough of emerging technologies such as cloud computing, big data, Internet of Things, artificial intelligence, and mixed reality, the fourth industrial revolution has quietly begun. We do not want to see existing industries or enterprises be undermined or replaced in the era of AI. Rather, we hope that digital transformation can allow them to become more productive and competitive. The third path: Strengthen national and government guidance, and make AI more effective under the direction of policies, laws, and regulations. Technology is not the greatest problem among the many challenges faced by AI. The human role with regards to it is worthier of attention. AI, developed by generations of outstanding scientists, must be better managed and regulated in order to truly benefit humanity. We also need a force to moderate the impact of technology on human society. Policies and laws are critical in setting regulations and norms. Many problems under the three major challenges mentioned above can also be tackled at the national level. For example, issues such as unemployment, inequality, security, monopoly, biases, and education all require the support of the government. Unfortunately, human progress and technological progress are not in sync; there is a time lapse between the two. To create a smooth transition during this period so that people affected by technology can have other choices requires the attention and support of the government. AI has triggered new problems, which arise from the interactions among people, technology, and society. However, most of the current industry standards and regulations were not created specifically in reference to AI. Formulating laws and regulations that can prevent non-benign interactions should be a top priority. The role that the state and the government should play in the era of AI requires our further thought and consideration. The fourth path: Urge self-discipline in technology companies and render AI more secure, transparent, and explicable. Technology companies are the beneficiaries of AI technology and should shoulder the social responsibility for technology applications, and allow AI to be more reliable. Since initiating research in the field of AI, Microsoft has always paid attention to the ethical issues of AI development and application. As a co-founder of Partnership on AI (PAI), Microsoft is committed to promoting discussions and actions on related issues. In the book “The Future Computed, Artificial Intelligence and its role in society,” Brad Smith, President of Microsoft, and Dr. Harry Shum, Executive Vice President of Microsoft, proposed the “six principles of AI development” based on Microsoft’s values. These principles are: fairness, reliability and safety, privacy and security, inclusion, transparency, and accountability. Fairness means that AI systems should treat everyone justly and equitably. To achieve this, developers must understand how various prejudices may exist, how they could have been introduced into the system, and how to prevent their introduction. AI cannot have a future unless it is reliable and predictable to ensure the safe operation of AI. The establishment of privacy and security is the key to obtaining trust in data and cloud computing services. This requires AI systems to have measures to safeguard customer information and prevent privacy violations. Inclusion requires AI to understand user needs, intentions, and expectations. Transparency and accountability lie at the foundation of all six principles. People have the right to understand how AI works and how it helps them make decisions. System developers should be involved in the standardization and guidance process, providing oversight of operations and establishing accountability standards. The report “Foundation for the Future – Artificial Intelligence’s Role in Society and Ethics,” led by the China Development Research Foundation and supported by Microsoft, was officially released in Beijing in September of 2018. As a partner, Microsoft shared its management and research experience from the past decades with the China Development Research Foundation. 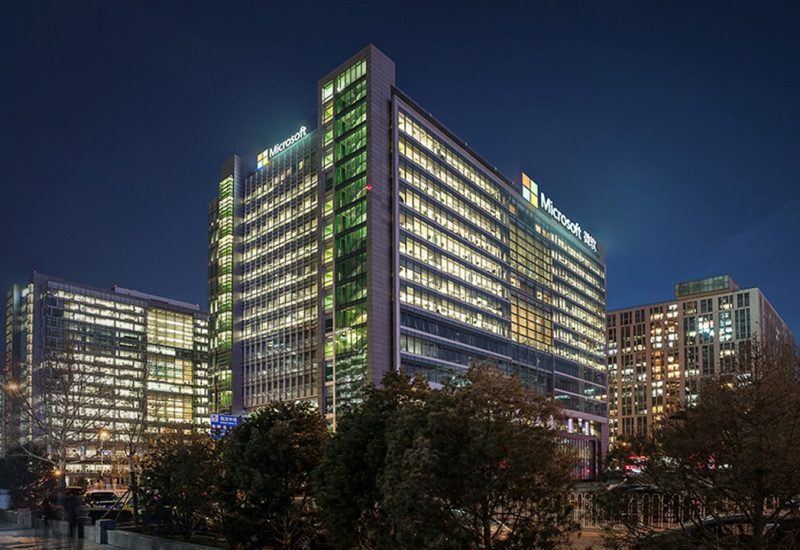 Microsoft will continue to consider the role of AI in human society, and will work with governments and research institutions to ensure that AI is better regulated and managed, allowing science and technology to benefit the world. When facing the challenges posed by AI, we should be committed to helping everyone prepare for adequate responses, including helping students to cope with future career challenges, helping workers deal with changing industry conditions, and building a system to match workers with employment opportunities. Realizing “AI for good” requires cooperation between all industries, including the technology sector. Microsoft looks forward to working with practitioners from all fields to develop and share best practices. “AI for good” can be achieved by popularizing computational thinking education, promoting digital transformation, strengthening government participation, and achieving self-discipline in technology companies. AI benefiting mankind is not just a vision, but a future we are all headed towards.